How much does it cost to travel to Ecuador? How much money will you need in Ecuador? $42 is the average daily price for traveling in Ecuador. The average price of food for one day is $13. The average price of a hotel for a couple is $28. Additional pricing is in the table below. These average travel prices have been collected from other travelers to help you plan your own travel budget. How much money do I need for Ecuador? Ecuador is located in the northwestern part of South America and has a coastline along the Pacific Ocean. It is, perhaps, most famed for the Galapagos Islands, although there are many other destinations within the country including a large number of UNESCO World Heritage Sites. Some of these include Cotopaxi, the world's highest active volcano and the city of Cuenca, among others. The country is divided into four distinct regions. These include the Amazon Rainforest in the east, the Andean Highlands in the central area, and the Coastal Lowlands along the Pacific Ocean. Finally, the Galapagos Islands are remontely located about 1,000 kilometers from the South American coastline. Many visitors arrive through the capital city of Quito. It's a fascinating city to spend some time and has a historic center that is one of the largest and best preserved in South America. It was also the first World Cultural Heritage Site in 1978, along with Krakow. Ecuador has regions that experience almost all climates. It is tropical along the coast and cooler and dryer in the inland areas that have higher elevations. The Amazon Rainforest is also very tropical. Although the climate is quite diverse across regions, once you are in a region, the weather stays relatively consistent throughout the year. Many visitors choose to take a Spanish course while they're in Ecuador. There are many different private Spanish academies in Quito. Although the quality is variable, this is usually a great way to learn or improve your Spanish skills. Ecuador uses the US dollar as its currency and most places do not accept any other form of currency. Generally business is conducted with paper cash as opposed to credit cards. Larger bills are rarely taken as well, so it is best to have many smaller bills to pay with. You can break larger bills at most banks. Also make sure your bills are new and not worn, as older bills are often declined. Ecuador is among the safest countries in South America. The crime rate is relatively low, almost half of that in found in much of the United States. 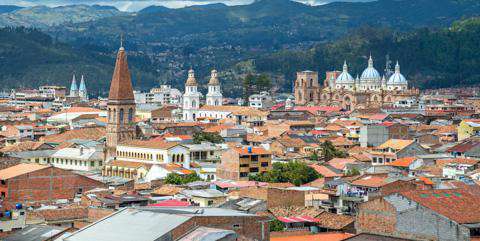 Some of the safest areas to visit include the cities of Cuenca and Laja, in the province of Azuay. Many people choose to give back a little during their time in Ecuador by volunteering. There are a variety of organizations you can volunteer with, but research the options thoroughly in advance. You can work on anything from conservation projects to building homes or teaching English. There are many third party organizations that can help you coordinate your options, or you may contact an NGO directly. Major cities have a good number of Internet cafes that travelers can use, and smaller towns usually have at least one option. The cost is low and the access is typically high-speed. Free wi-fi is available in some hotels and restaurants but is often password protected. They will usually give you the password if you ask. Galapagos Islands: The most famed spot in Ecuador, the Galapagos Islands are uniquely diverse and spectacular. They are found in the eastern Pacific Ocean and are quite remote and isolated, making them difficult and expensive to visit. They are 1,000 kilometers from South America and are made up of 13 larger islands and 6 smaller isles. There are travel restrictions that make visiting the islands even more challenging and the only way to reach the Galapagos is by plane from Guayaquil or Quito airports. Amazon Rainforest: Ecuador is often overlooked as a great spot to immerse yourself in the diversity of the Amazon Rainforest. The Cuyabeno Wildlife Reserve is one of the best places to visit the Amazon in Ecuador. There are other national parks you could visit, but this area is known for its biodiversity and indigenous communities. Cuenca: This is a World Heritage City that was established 1000s of years ago. It sits at the intersection of five rivers and offers visitors a nice example of colonial Spanish architecture. It has a large old town with cobble stoned streets and is very clean and impressive to visit. Locro de papa: This is a famous Ecuadorian soup that is made with potatoes and cheese. It is usually garnished with avocado and served with a spicy aji sauce. The dish itself is quite simple and filling, and it is a staple throughout most of Ecuador. Ceviche: Ceviche is a popular dish along the coast and is made with a cold seafood cocktail. The Ecuadorian variety is often served with "chifles," which are thin fried plantains, and popcorn. Encebollado: This hearty fish soup is made with yucca and is common on the coast. It is tomato based and prepared the pieces of yucca and marinated vegetables. For crunch, some restaurants add "chifles".